First a disclaimer / warning. I’m going to show you how to make your site feel faster without speeding it up. If the users feel that it’s fast, then it’s fast enough. However, it might be better to try to just make it faster in the first place. This article assumes you have either tried or ruled out things like increasing the DB performance by adding the proper indexes, caching data where feasible, optimizing queries, etc. OK, assuming you’ve done as much as you can for pure performance, let’s get to improving the experience for the users. Consider a basic website that shows data from several sources. In the sample case, it’s kind of an iGoogle landing page with different items: TODO, news, etc. In the screenshot below you can see there are several sets of information shown (my details, news, and most popular items). It turns out that my details and the main page are actually pretty fast. The news and popular items are not. Yet, we are computing them all at once in the MVC action. Thus the whole page feels sluggish and slow. Here is the underlying controller action method. Latency matters. Amazon found every 100ms of latency cost them 1% in sales. Google found an extra .5 seconds in search page generation time dropped traffic by 20%. So a simple solution would be to break the loading of the slower sections (news & popular in our case) apart from the faster sections in the page. We can load the fast data immediately using direct model to razor processing and push the loading of the slow parts to an asynchronous operation using AJAX. That might be a lot of work in general. But with MVC we can employ a few techniques and really make this simple and foolproof. 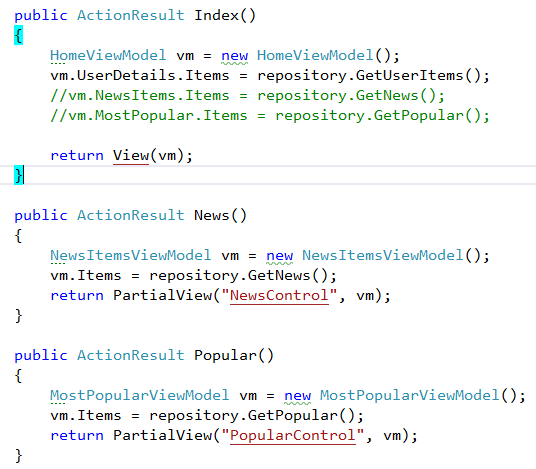 First, we’re in luck from the start because we are already using partial views (a key step) for our razor code. If you don’t have partial views, they are easy to add. Here is the relevant page section which renders the data synchronously. It is important to note that we are returning PartialView (not View) for the parts that were previously managed in the view (news & popular). Assuming the metrics above, the page will now load in 10ms. That’s vastly better than 2,500ms. With razor rendering time and other overhead it’s more like 50ms, but still vastly better. Each section that will be loaded asynchronously now has three changes. We have a div with the class partialContents. We use this in jQuery to locate them. Each partialContents section has a data-url for the location of the partialview controller action. Each partialContents section has a message and image to show an AJAX indicator that we are working on that area. There is no extra effort to show this. It appears by default and will be replaced as the content loads. So the controller is ready to serve up this partial content. The view is showing a pending action and has a place to put the results. The final step is to just add the smallest amount of jQuery to do the download and update. That’s it! Now our site loads the slow sections in parallel and asynchronously. Now the whole page is ready in around 2 seconds which is in some sense truly faster (not just perceived) than the original. So to recap, here are the steps we performed. Identified the segments of data that are slow. Took the original action method and change it to only load the fast content in the controller. Moved the CSHTML responsible for rendering each slow section to a partial view if it was not already done. 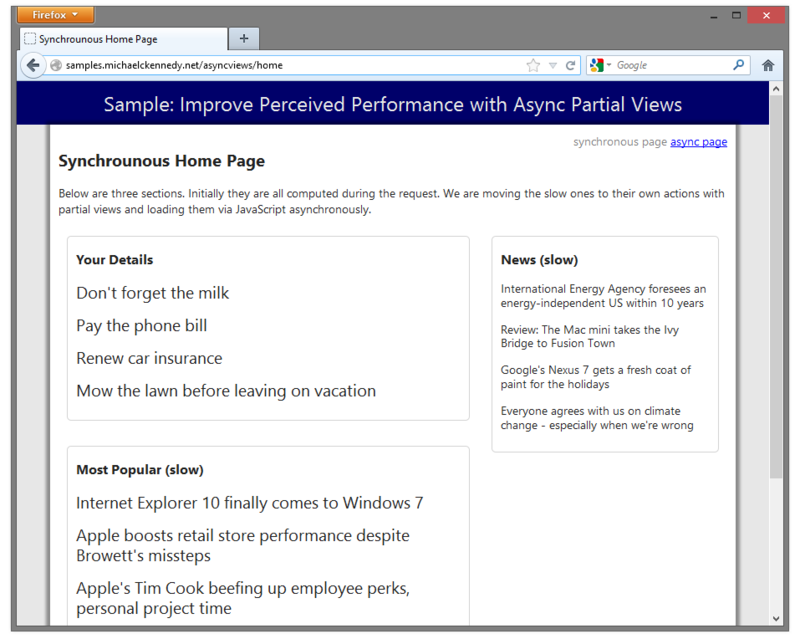 Added an action method returning a PartialViewResult for each async section. Added a partialContent pending section with loading message and data-url to parts of the original page which are going to be loaded asynchronously. Use jQuery to find and call .load() for each section. That’s it. Hopefully you will find this a useful technique for your slower pages. I like that solution. Thank you. Nice and clear article Michael. I did something similar to this in a page that included widgets where the page widgets references were stored in a database. Basically the initial page viewmodel has a list of the widgets and then I use AJAX to load them dynamically. I might incorporate your ‘loading …’ feature to make it look a little slicker. Thanks. Hi Richard. Thanks. Glad you could take something away from the article to help. Cool. You should also make the data source calls (be they EF or WebServices, or whatever) use async and await as they are so long running. Thanks for the comment. You’re absolutely right. While we’re busy parallelizing the requests from the client, the partial view action methods I was hitting with Ajax could easily have been decorated with async / await. Good advice. I don’t get what do we gain by using async on server side when we already call it asynchronously from client. Nice article. I just did a similar dashboard, and now profiling EF and making optimizations. Most of my performance issues were usually related with “SELECT N+1” queries. But even if I make optimizations to each part, the sum effect of all will be significant. I will probably use your approach for all the parts, not just the slow ones. Glad you liked it. I agree that you should look to obvious perf issues first before making them just run in the background. BTW, if possible, look at Scott’s recommendation (previous comment). If you can use async and await as you wait on the DB you’ll be even better off from a scalability perspective (won’t affect single user perf much). This is exactly what I was looking for! 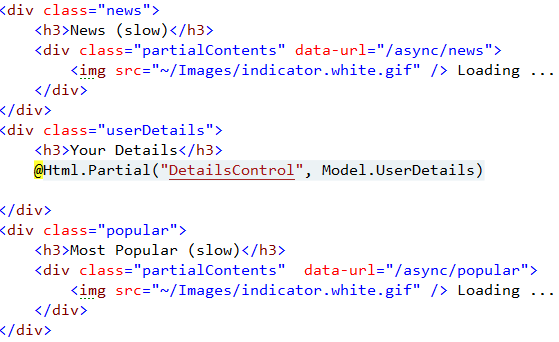 I am sort of surprised that the default behavior of Html.Partial() and Html.RenderAction() are not asynchronous. Perhaps a stupid question, but how would you handle calling the partial view methods with a parameter? E.g. let’s say the News method was changed to News(string subscriberId). Right, sorry! The html I put in there was entered AS HTML because I”m the editor on the blog. Sorry. think angle bracket when you see [div] etc. Can’t an AsyncController be used for these partials? Yes, you can use AsyncControllers as Scott Hanselman was commenting above (async & await is the new way). But that doesn’t significantly increase the load time. It does parallelize it but in my example this would drop the load time from 2.6s to 2.0s. The technique in the article takes it from 2.6s to 0.05s. It doesn’t work with enabled Session. If Session is enabled (by default) then all requests in Session are executed consequentially and performance will be same time + time to round-trip for each ajax call. @Entity Framework doesn’t support async operations yet. It looks like EF6 will implement this feature. Anyway, I like this approach, when the content is not important for search engines. Thanks. Yes, we’ll have to wait for EF 6 (which shouldn’t be too long) for async & await. Your point about SEO and this content is totally right. It’s basically invisible to Google and Bing. Unless it is necesary to have any new content available immediately on every page hit, would it be faster to cache these slow page elements. This is awesome! Thanks Mike. You’re most welcome, thanks for saying so! Nobody has talked about the possible impact of this technique regarding SEO as the bot don’t see the lazy loaded content, I’d use this for content not to be indexed by search engines, or in web applications where nothing should be indexed. Thanks for sharing! A very good point I overlooked in the article. My original use-case was for an internal app so SEO wasn’t top of mine. But yes, if the content needs to be found via search you’ll need to do a little extra work to provide something. But the async stuff won’t be indexed. Neat solution. Thanks. Have an idea tho. Wouldn’t it be nice to turn this into a HtmlHelper extensions method to keep it as simple as possible? Something like this. Html.PartialAjax or PartialAsync (which could be misleading given async keyword). Are there any cons? I like your solution. It is awesome ! Nice clean Article! Liked the way it was presented. I am beginner to use MVC architecture , Will you please make me to understand what is the need of repository’s,Please mail me if you have related content on MVC (Material). Excellent article Michael. Thanks a lot. Let’s try again… (Re-post! )… First of all, I thought It is a great article… Only wished I had found it sooner! Now I’m trying to load and run your sample code but it’s trying to force me to download IIS Express. I’d rather if possible use the build-in web server that runs when you run and mvc app in .net or use the regular IIS which I already have on my pc. Is there a way to disable this? I’ve tried setting up UseIIS to false in the .csproj file but it didn’t like that! Any ideas? Thanks! And you should be able to run the project without IIS express. Just go to the project properties, web tab and choose development web server rather than IIS express. Hi, Thanks for the reply. I tried what you suggested, but it just wouldn’t let me load the project unless I accepted to download IIS Express, so I gave in ;) .. All is still working, so no worries. Great article but is there a way to run the project without IIS express. Thanks. Simple and efficient. Adopted ! Michael, any thoughts on how to make the jquery load call happen only when the div’s are in view for the user’s screen? IE. if it is below the fold then don’t load the data/html. I am using a jquery plugin to lazy load some images but this same idea would be great to use on the div elements, etc. Basically lets your register for when content is scrolled into view rather than document.ready(). I think you could move the code over to these events and pretty much reuse the same idea here. Is there a way to use this mechanism in conjunction with an actionlink and passing a parameter to it? I want to have a few with a list of items and when the user clicks on one of the item listed, I want to display the data for this item in a view on the right inside? Thanks. Yeah, totally. But I don’t think you need actionlink (although you could use it). Where I had data-url=”/some/url” just pass the data there. Either by constructing the URL explicitly or using Url.ActionLink(). I very much like your approach. I was looking for something similar, though my requirement is bit different. I am going to try your way Nd if this works, you are my super hero. Mmmh… why is the razor version 5 times slower? I think you misunderstood. They are BOTH razor – basically identical code. One uses the async technique, the other does not. Glad it’s working well for you! Interesting twist for sure. Michael, your approach has really helped an application I am working on in so many ways, thank you! There is one scenario I need help with if you have the time. Background – my primary view contains a PartialView that loads some modal content, and a button to trigger the modal to pop up. The modal content includes the div tag with the “partialContents” class and url. Glad you got it figured out Michael. :) Looks like the solution I was thinking of as well. Works for me. Make sure you are using IE 9+ and that its dev tools aren’t set to an older version. I think I might be using jQuery 2.0 which needs a new IE. I realize this is an older article, but it would fix an issue i currently have and i’m having trouble with it. When i implement the above and ran it the first partial will return correctly while each other partial returns an error 500, i have manually checked that the partials are available and they are and if i change the order of the partials i can get different ones to be the first and show up, but never more than one, any idea why this is happening? Hmmm, sorry for the trouble. I’ll see if I can track it down. I am trying your method to speed up my pageload. But problem is I am using EditorTemplates(6 different templates) and I need to submit all data together. Currently my pageload takes around 20secs. Did you ever improve speed with editortemplates? Hey Michael, do you know how will this impact SEO? After 4 months all of our content from the partial div has literally dissapeard from Google. My rule thumb is that the important SEO content needs to be part of the static page delivered initially. Basically, do a view source, and that’s what Google will see. I’m sorry if this is caused you trouble I should add something like this to the article itself. 2) I saw this message in Dev Console: [Deprecation] Synchronous XMLHttpRequest on the main thread is deprecated because of its detrimental effects to the end user’s experience. For more help, check https://xhr.spec.whatwg.org/. Hi Michael, there will be a noobie question: I just don’t get when News() and Popular() methods are called. Index – when starting and that;s ok, but the other 2? Nice Article ,I have learn well from Your Article,but one question We will have to wait for 2 remaining partial views if we want some event like click in first loaded view. Can we use first view without waiting for other 2 to load? I’ve been looking for an asynchronuous way of doing this exact thing the whole night !